A batsman who's at the crease is required to concentrate on scoring runs. But those runs aren't taken only by running; four and six runs are also available through the boundaries. If a player keeps taking singles and twos through running between the wickets, he will get tired soon. Naturally, the loss of energy due to running prompts batsmen to look for big hits every now and then. 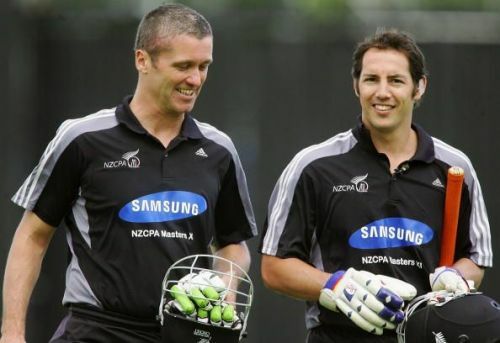 But New Zealand's Adam Parore once scored 96 runs without a single boundary. That remarkable feat came in a one-day match against India. In 1994, the Wills World Series hosted a one-day series in India. Three teams - India, New Zealand and West Indies - participated in the series. India and West Indies clashed in their first match, which the Indian team won by 54 runs. India and New Zealand then met each other in the third match. New Zealand captain Ken Rutherford won the toss and chose to bat first. Bryan Young was out on just 5 runs and Blair Hartland lost his wicket for 8. The batting lineup was showing signs of collapse, with everyone struggling against the Indian bowlers. But then, wicketkeeper Adam Parore came to the crease to join captain Rutherford, and the recovery began. The two batsmen steadied the ship with their impressive batting. Rutherford played aggressively, while at the other end Parore was more patient. They put on a 180-run partnership for the third wicket. But Parore completely eschewed the big shots, and approached the innings more like a Test match. The Indian fielders were also brilliant that day; they stopped all the well-timed shots that Parore hit. Unfortunately, Parore lost his wicket to Manoj Prabhakar when he was on 96 off 138 balls. He missed a well-deserved century by just 4 runs. With that innings, Parore became the highest run scorer ever without a boundary. In the end, New Zealand scored 269 runs, but the Indian team chased down the target in just 48.1 overs. In the final of the series, the Indian team defeated the West Indies and won the trophy.